FC Barcelona advanced to the playoffs on Thursday night - exactly 30 years after lifting its first European trophy, the 1985 Cup Winners' Cup. 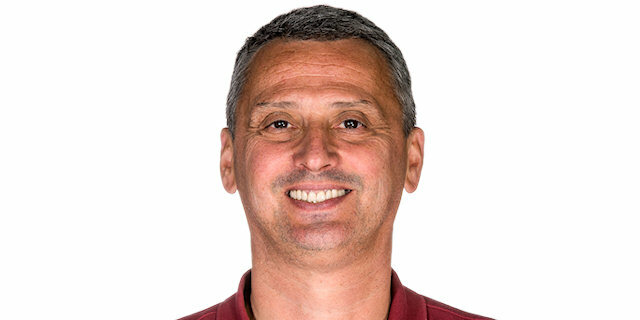 Barcelona grabbed its fifth consecutive win in Top 16 Group E by downing Crvena Zvezda Telekom Belgrade 73-77 in front of over 18,000 fans in the Serbian capital, but could not celebrate a spot in the next stage until Maccabi Electra Tel Aviv completed its victory over Zalgiris Kaunas later in the evening. 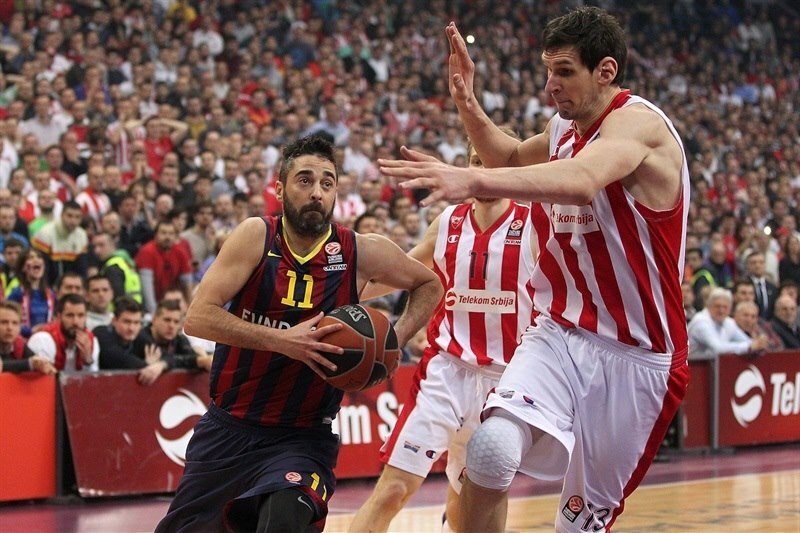 Barcelona improved to 8-3, while Zvezda dropped to 3-8. 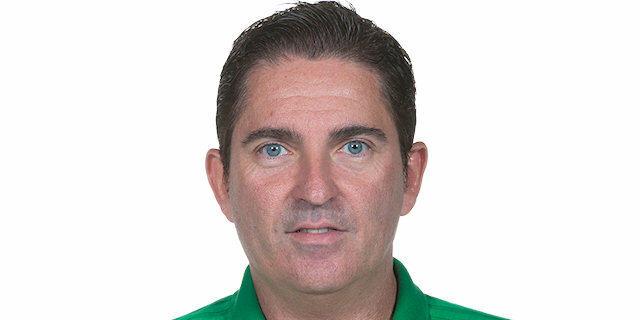 Juan Carlos Navarro led the winners with 12 points. 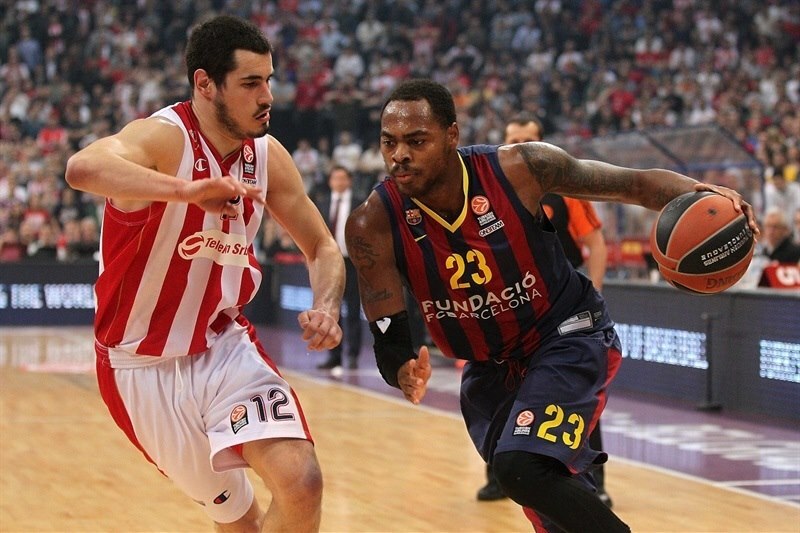 Tomas Satoransky added 11 and 10 rebounds and Marcelinho Huertas and DeShaun Thomas each scored 10 points for Barcelona. Boban Marjanovic led Zvezda with 23 points and 11 rebounds for his 13th double-double in this Turkish Airlines Euroleague season. Jaka Blazic and Nikola Kalinic each had 10 for the hosts. The game saw both teams take promising leads before the hosts entered the fourth quarter up 50-48. A mid-range jumper by Stefan Jovic tied it at 56-56, but Navarro led an 0-8 run that put Barcelona ahead for good, 56-64. Zvezda got within 67-68 in the next-to-last minute, but Navarro fed Ante Tomic for a slam and made free throws for a 67-73 score. Blazic hit back-to-back three-pointers, but free throws by Justin Doellman and Satoransky allowed Barcelona to escape Kombank Arena with a win. Luka Mitrovic got Zvezda going with a layup, which Navarro erased with a rainbow jumper. Marjanovic provided a highlight with a put-back dunk and soon added an off-balance three-point play for a 7-2 Zvezda lead, as Ante Tomic went to the bench with 2 fouls. 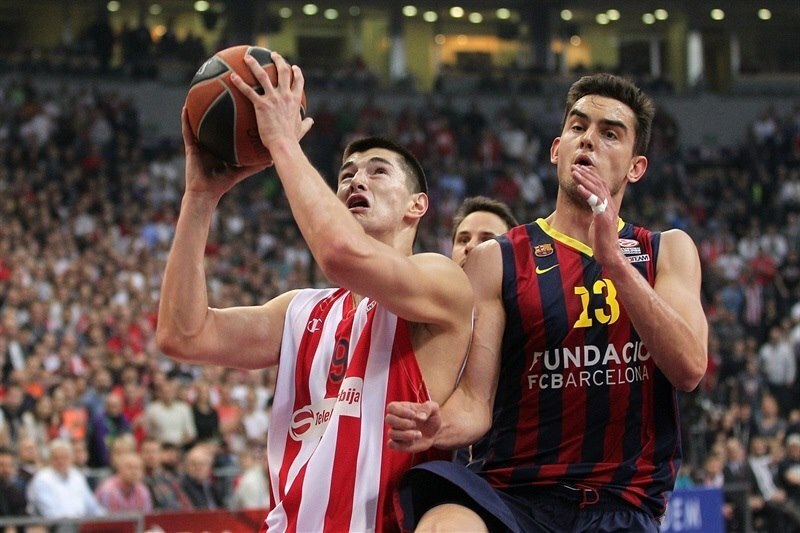 Tomas Satoransky found space for a slam and a jump hook by Thomas kept Barcelona within 7-6. Jaka Blazic shined with a backdoor layup, but free throws by Satoransky tied it at 9-9. Marjanovic split foul shots before a slam by Tibor Pleiss gave Barcelona its first lead, 10-11. Marjanovic scored down low, but back-to-back layups by Thomas gave the guests a 12-15 edge. 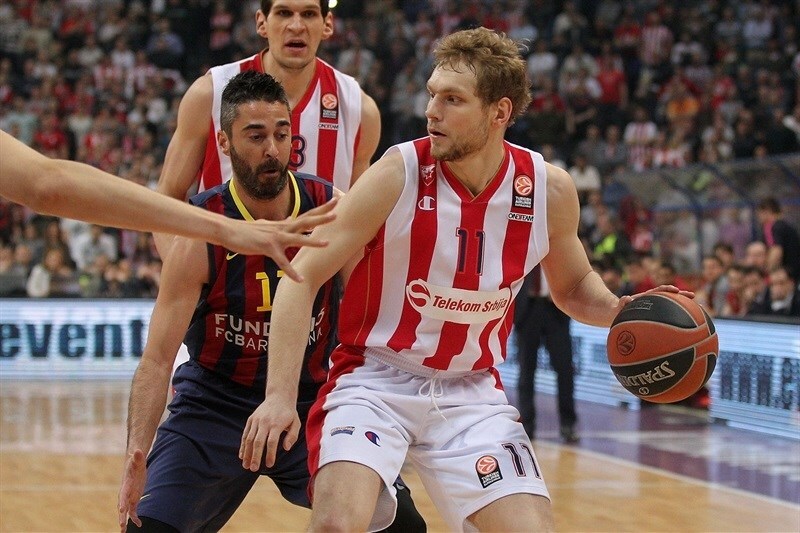 Barcelona improved its defense and stopped Marjanovic in the low post, limiting Zvezda to 5-of-17 two-point shooting. Marko Tejic produced a highlight with a buzzer-beating three-pointer that tied it at 15-15 after 10 minutes. Bostjan Nachbar struck from downtown early in the quarter and a one-handed floater by Huertas gave Barcelona a 15-20 margin. Charles Jenkins stepped up with a driving basket that Maciej Lampe erased with a backdoor layup. A three-pointer by Brad Oleson forced Zvezda to call timeout at 17-25. Nemanja Dangubic nailed a five-meter jumper that a red-hot Oleson bettered with a triple from the corner. Marjanovic returned to the floor and immediately delivered with a layup, but Huertas answered with a baseline jumper. Tomic hit a jump hook that made it a double-digit game, 21-32. Dangubic struck from downtown and a big basket by Marjanovic brought Zvezda within 6. Kalinic took over with an off-balance basket, but Satoransky matched it with a driving layup. Marcus Williams shined with a power basket, before Nachbar hit a triple and a layup by Marjanovic kept Zvezda within 32-37 at halftime. Thomas shined with a second-chance basket immediately after the break, as Barcelona kept excelling on defense; it held Zvezda scoreless for more than two minutes. Mitrovic stepped up with a jump hook and a layup by Marjanovic brought the hosts within 36-39. Zvezda tried to run the floor with Williams, Jenkins and Kalinic together on court. Thomas hit a one-handed jumper off the baseline, but Jenkins bettered that with a bomb from downtown and added a big basket in transition that tied the game at 41-41. Oleson rescued Barcelona with a corner three-pointer, but Kalinic also hit one from beyond the arc and a five-meter jumper by Williams completed the hosts' comeback at 46-44. 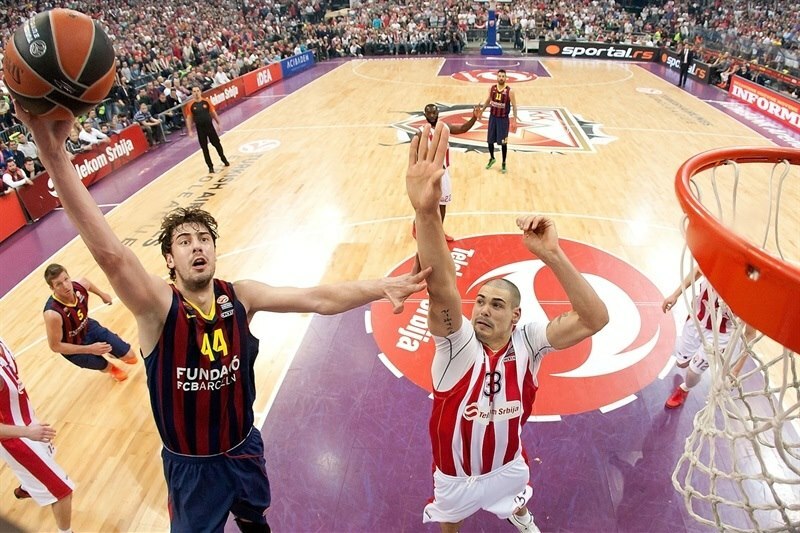 Kalinic hit free throws and a fast break layup by Stefan Jovic caused Barcelona to call timeout at 50-44. 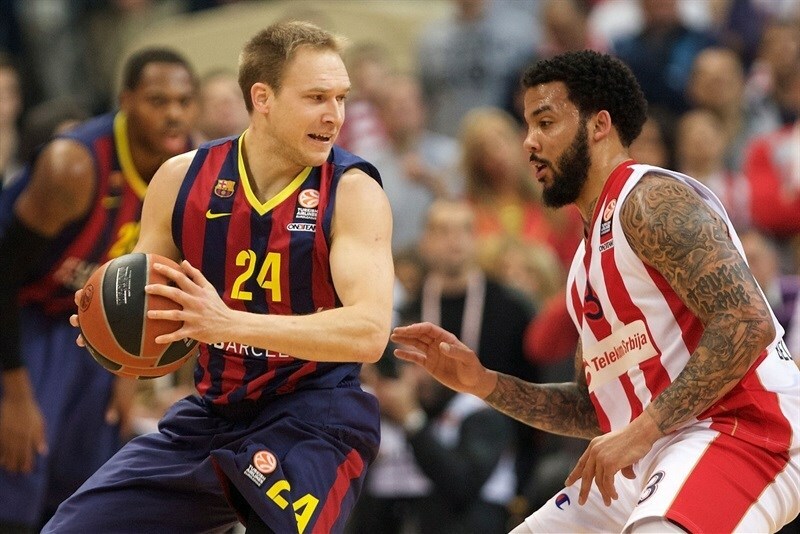 Huertas tried to change things with a driving layup and a mid-range jumper, which brought Barcelona within 50-48. Marjanovic hit a close jumper early in the quarter, but a tip-in by Tomic and a close basket by Huertas tied it at 52-52. Marjanovic found space for an uncontested dunk, which Navarro erased with a five-meter jumper. Tomic scored around the basket and a mid-range jumper by Jovic tied it at 56-56 with over six minutes left. Justin Doellman hit 3 of 4 free throws and a three-pointer by Navarro saw the hosts call timeout at 56-62. Satoransky made free throws to cap a 0-8 run, but a three-pointer by Dangubic gave Zvezda hope at 59-64. After Navarro sank foul shots, Marjanovic shined with a three-point play, but Doellman hit his trademark jumper off the glass to make it 62-68 with over two minutes left. Kalinic struck from downtown and free throws by Blazic made it 67-68 with 1:18 left. 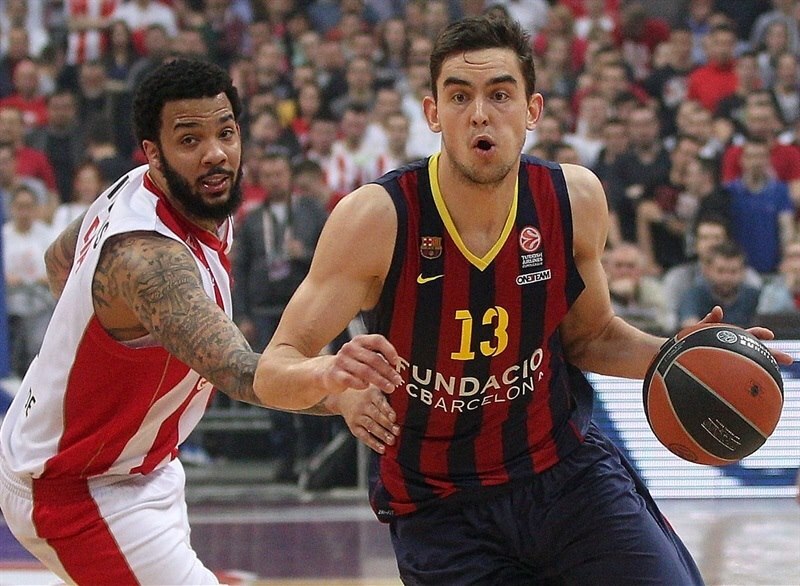 Navarro fed Tomic for a dunk and hit free throws for a 67-73 Barcelona edge with 20.7 seconds left. Blazic buried a huge three-pointer and bettered Doellman's free throws with another bomb from downtown for a 73-75 Zvezda deficit. 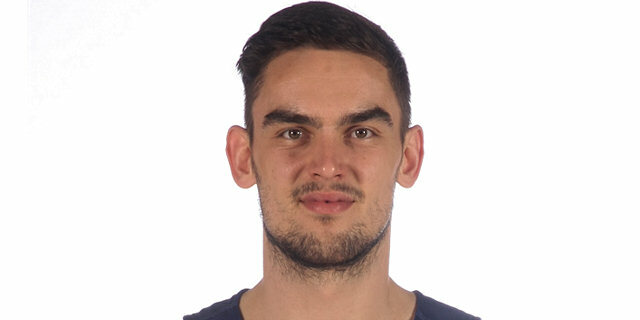 However free throws by Satoransky sealed it for Barcelona down the stretch. "Congratulations to Barcelona for big game and win. And we had another big performance, but it was not good enough to beat excellent Barca. Offensive rebounding was our problem and we gave away so many second chances to the visiting team. In the final minutes, our defense failed to help us get a chance for a winning ball. Most important is that we are in a streak of good performances and I hope we are going to book at least one more win in the Turkish Airlines Euroleague." 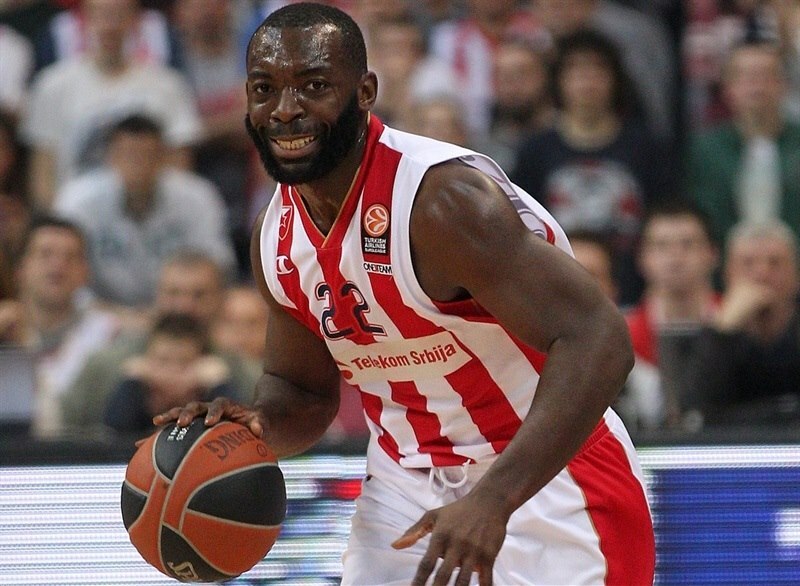 "Congratulations to Crvena Zvezda Telekom for a beautiful evening. That was our best game of the season. We were excellent in all elements except in three-point shooting percentage. We knew Marjanovic is unstoppable, but we managed to limit Marcus Williams and Charles Jenkins and that was our plan." "We had to work really hard for this win. We have to be really concentrated for all 40 minutes and even though we lost control a little bit and didn't take good decisions, our defense was aggressive all game long and above all, we powered the offensive boards really well. That allowed us a lot of second-chance shots to control the game, but we had to battle until the end. We knew that this game was really important. We hope to carry on getting better on the road and do even better against Zalgiris in Kaunas next week."